Because Chelan PUD is an electric utility, we’re restricted from offering weatherization rebates to residents who have oil or gas heat. But we still get calls from those folks asking for help — and we try to help. Mark Wiser, senior residential adviser, recently responded to a Chelan resident asking for tips on improving the energy efficiency of her home. She had plans to convert to electric heat, but was using oil for the time being. We think others might find his tips helpful, too, so we’re reprinting portions of Mark’s email message here. “I’d recommend you first do the inexpensive and low-cost things and then get the big stuff. Looking at the energy use of your home over the last six years, a couple things stand out. First, during the last two years there was very little energy use, but before that the base use was pretty high. Base use is the non heating/cooling use. Higher use is usually hot water, lighting and appliances. Water heating alone can equal 20 percent of your electric bill. Use energy efficient lamps like CFLs, turn your water heater down to 120 degrees and only use hot water when you need it. Wash clothes in cold water and only full loads. Purchase Energy Star appliances, especially clothes washers, dishwashers and refrigerators. Purchase an Energy Star water heater when your existing one goes out. Wrap the hot and cold water pipes with insulation if the water heater is in the garage or other unheated area. If in heated areas, wrap the pipes from the water heater at least five feet, or as far as you can up to five feet. If your water heater is sitting on a concrete slab, like in a basement, set it on R10 foam insulation. These are sold for water heaters. Heating accounts for 40 percent to 50 percent of your electric bill. Keep the thermostat as low as you can and still be comfortable. Ceiling fans will also help. Look and feel for drafts in the outside walls, under sinks, and around outlets and switches both on outside walls and inside walls. When you find leaks, seal with caulk, weather-stripping or outlet gaskets. Look for recessed lights in the ceiling. Seal around those with caulk between the drywall and fixture. Don’t caulk any of the openings in the fixture, since they may be for exhausting heat. Add insulation to the walls, attic, basement walls or underfloor as needed. A contractor will look at your home and give you an estimate. We have a list of contractors who are licensed and bonded here. If you add a heating system with ductwork, make sure the ducts are sealed at all joints and connections. You may have to ask for this and pay a little extra. If you install (or have) a furnace or zonal wall heaters, set the thermostats back when you are not around or when sleeping (I set mine to 55). If you have a heat pump, select a comfortable temperature and only set it back two degrees. Heating should be around 68 -72 degrees. Cooling, 76 – 80. Replace the windows with new vinyl framed windows with an NFRC rating of U.30 or lower. Replace your exterior doors with insulated fiberglass or steel doors. Consider a ductless heat pump. Here is a Home Energy Checklist that will give you other tips on what to look for and do to conserve. 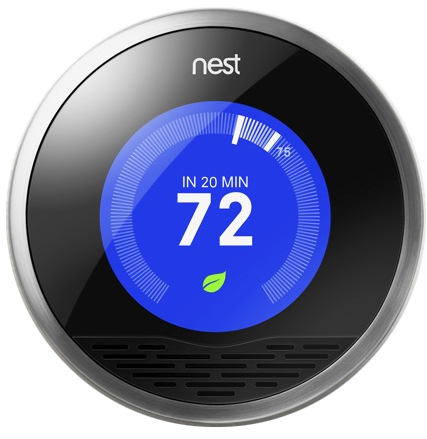 Enter our Facebook drawing to win an elegant Nest Learning Thermostat. This thermostat learns your behavior, then programs itself to adjust when you’re away. All you need to do is change the temperature for a few days to teach Nest. After that, the Nest learns about you and your home and starts activating features to save you more energy. You can operate it remotely from your office or phone. And unlike many other thermostats, it’s good looking. One lucky Chelan PUD customer will win a free Nest, complete with installation. Be our guest, win a Nest! The promotion ends at noon Monday, Oct. 22, so don’t delay, enter today. Third-grade teacher Vicki Anderson helps students with a science project in a classroom outfitted with new energy-efficient lighting. Major heating and lighting improvements at the elementary school in Chelan are saving money and improving comfort. Gone are the noisy, inefficient heat pumps and stagnant air. Gone are the irritating fluorescent lights that flicker, buzz and hum. The only humming at Morgen Owings Elementary now is from school officials tickled with the improved environment and energy savings at the building. They’re singing the praises of PSF Mechanical, the Seattle contractor that worked through the summer to install the upgrades by the first day of school Sept. 5. Seattle-based PSF is an ESCO, or energy services company, pre-qualified by the state Superintendent of Public Instruction to work with K-12 schools. An energy efficiency audit identified potential savings in HVAC and lighting at both the elementary school and middle/high school. 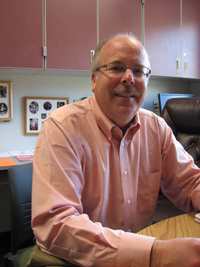 With help from PSF, the district secured a state grant for $550,000. Chelan County PUD contributed $41,000 through its Resource$mart program and the school district paid the rest of the $1.1 million cost. The elementary school was treated to a complete upgrade of its heating, ventilation and air conditioning (HVAC) system and all new lighting. Chelan Middle/High School received new lighting only. The control center for Morgen Owings' new energy management system. Energy savings at the two buildings is projected at 682,694 kilowatt hours per year — enough to power 31 Chelan County homes. As part of the package, PSF guarantees that energy savings will occur. If savings projections aren’t reached, PSF agrees to pay the difference, said Dan Hering, business development manager for PSF. More than 2,000 fluorescent lights were replaced at the two schools. At the elementary school, 52 new high-efficiency heat pumps were installed, air circulation equipment was upgraded, and “smart” controls were added. Thermostat set points now are controlled by a digital thermostat, central computer and network of “distributed intelligence” Hering said. Changes can be made remotely, and the building is monitored and metered for energy consumption. Chelan Business Manager Scott Renick said if funds allow, a similar HVAC upgrade could occur at the middle/high school building. Wenatchee High School is in line for a lighting retrofit this school year. Bryan Visscher, maintenance and operations supervisor, said lighting will be replaced throughout the building. Wenatchee is using Ameresco Quantum, another energy services company pre-qualified through the state energy program. The high school project involves a complete overhaul of all lighting at a cost of about $650,000, Visscher said, with $255,000 covered by a state grant and $51,000 coming from the PUD’s Resource$mart energy efficiency program. The remainder will be paid by the school district. Work will be done in the evenings beginning this fall and continuing through the spring. Projected energy savings is 858,085 kilowatt hours per year, or enough to power 39 homes. Click here to view a graph showing early energy savings at Morgen Owings Elementary. Fourteen-year-old Bryce Newberry of Wenatchee has entered a national young reporters contest with a news clip about saving energy. Newberry’s clip includes an interview with staff at Chelan County PUD, and reminds viewers to check insulation in their homes, switch to compact fluorescent light bulbs, use the dishwasher instead of hand-washing dishes, and keep the thermostat at reasonable settings. This is the second time Newberry has entered a Teen Kids News contest. Last year his clip on the future of newspapers made it to the contest’s top 10. Newberry also has been a special guest on KOMO News in Seattle after broadcasters there saw a videotape Newberry made of himself imitating the KOMO Morning News crew. Newberry said he’s wanted to be a newscaster for several years. His career goal is to work for a major network. Winners in the Teen Kids News contest are chosen by popular vote. Voting begins Sept. 12 on the Teen Kids News website. Viewers can vote once a day. Programmable thermostats can save energy, but customers frequently call us with questions about how to use them. Energy Star has developed an interactive tool that leads consumers step-by-step through the programming process. Programmable thermostats allow you to set temperatures up or down when you are away or asleep. You can select settings for the season (heating or cooling), weekdays and weekends, for when you wake, leave and return. If you don’t have a programmable thermostat you can still turn your heat down manually before you go to bed or leave the home. If you have a heat pump, the setback should be just a couple degrees. In addition to saving energy, Energy Star focuses on programmable thermostats as a way to reduce greenhouse gas emissions that contribute to global warming. Chelan County PUD customers benefit from renewable hydropower which does not contribute to climate change. PUD power sold on the open market can help reduce global warming by diminishing the demand for additional energy produced from fossil fuels. Learn how to Use your Programmable Thermostat.